Official Cabaret Date, Time, and Location Released! 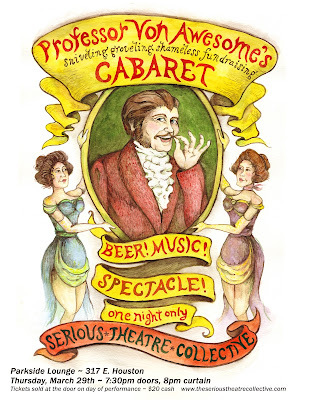 Professor von Awesome will return to the Parkside Lounge (317 E. Houston) for ONE NIGHT ONLY on Thursday March 29th to host Serious Theatre Collective's first ever Sniveling Groveling Shameless Fundraising Cabaret! Our cabaret will feature a list of performers and songs hand selected for maximum awesomeness- including Serious Theatre Collective favorites from The Legend of Johnny 15 and Professor von Awesome's Traveling Caravan of Cautionary Warnings! The sniveling groveling awesomeness will take place at the Parkside Lounge, 317 E. Houston (between Avenues B and C). On Thursday – March 29th . Running time is approximately 80 minutes. Tickets are sold at the door, on the night of the performance, $20; cash only.